Quality Tune-Up Shop, located at 2545 Arden Way in Sacramento, CA is a full service auto care and complete oil change shop. Coupons only valid if printed or on mobile device. ‍Save time! Call 916-953-6721 to Schedule an Appointment. At Quality Tune Up we offer a variety of services to keep your car running, help you get back on the road and on to wherever you're headed. Our trained mechanics check your car for safety and let you know if it needs any additional service to be properly maintained. How do I know I need air conditioning service? You know you’re overdue for service by the time your air conditioning is blowing warmer air than usual. We recommend checking your air conditioning system every spring. Check your owner’s manual or ask your Quality Tune-Up service adviser to determine when your car needs a change of fluid. What does an air conditioning service include? We inspect the drive belt for wear, visually inspect the system components for any obvious leaks or damage, check the operation of the compressor and advise you if any further repairs are needed. Our qualified mechanics use special equipment to evacuate the old refrigerant, vacuum test the system for leaks and recharge the system using the amount and type of refrigerant specified by the car manufacturer. Recharging your system keeps your air conditioner blowing cold air for those hot summer days. A thorough check of your system can reveal potential problems that are easily repaired if found early but expensive to fix if the component fails. How do I know when I need a new air filter? You can check your owner’s manual for recommended intervals but the easiest way to tell is by looking at the filter. A good rule of thumb is to replace the filter every other oil change. There are two types of air filters in your car, a cabin air filter and an engine air filter. You can check your owner’s manual for recommended intervals but the easiest way to tell is by looking at the filter. A good rule of thumb is to replace the filter every other oil change.There are two types of air filters in your car, a cabin air filter and an engine air filter. Why change the engine air filter? The engine air filter captures dirt and dust before they can enter the engine. Keeping your components clean contributes to your engine running more efficiently. A clean air filter allows uncontaminated air to pass freely into the combustion chamber of your engine. This also makes your engine run better, cleaner and use less gas. What about the cabin air filter? The air that passes through your climate control system is filtered for dust, pollen, mold spores and other particulates to keep your cabin clean and the air you breathe uncontaminated. A dirty filter puts stress on the climate components and does not effectively filter the air.Our qualified mechanics will check your filters free of charge any time you are in for service. We replace your worn out filter with a clean new filter made for your car. A clean engine filter allows your engine to run efficiently and saves gas. A clean cabin filter lets you and your family breathe easy. How often should I bring my vehicle into Quality Tune-Up for brake repair? To avoid dangerous situations, it is important to adhere to routine brake service and brake maintenance. We recommend having your brakes repaired and serviced by a professional mechanic at least once a year. At Quality Tune-Up, we take brake repair very seriously. What are the benefits of brake repair and brake maintenance? Brake repair is an important safety measure. Without properly working brakes, normal driving situations would take a turn for the worst. However, there are other benefits in getting routine brake service and brake repair. Changing your brake pads, when needed, saves wear on your rotors, which translates into less money spent down the line. At Quality Tune-Up, we always strive to achieve your 100% satisfaction. No matter the service, from brake repair to tune ups, we are eager to have your vehicle running in its peak performance. What is a serpentine belt and when should I have it replaced? The serpentine belt drives most of the power assisted components of your car including the air conditioning compressor, power steering pump, water pump and alternator. The serpentine belt should be replaced immediately when it begins to show signs of wear. The number one mechanical reason for roadside assistance is a broken serpentine belt. How does Quality Tune-Up help me avoid having my serpentine belt fail? Our trained mechanics visually inspect your serpentine belt every time you come in for routine service such as an oil change or scheduled maintenance. We will let you know when it needs to be changed. When your serpentine belt gets worn it no longer grips the pulleys of the components it drives properly. This may cause your alternator to not charge your system the way it should or your power steering to be jerky or your A/C compressor to run at less than full power. Keeping your serpentine belt in good condition helps all of the components it drives work better and helps you avoid on the road breakdowns. When should I replace the coolant in my car? Most manufacturers recommend replacing the coolant periodically to avoid expensive repairs. Your service adviser can tell you when your car needs new coolant. Why does it need to be replaced? The coolant in your car keeps the engine cool during the summer months and keeps the fluid from freezing in the cold of winter. The fluid naturally breaks down from constant use and no longer provides the protection you need. In addition the fluid becomes very corrosive and, if left unchanged, it will destroy the components of your cooling system. What does the coolant replacement service include? Our trained mechanics inspect the system for leaks and damage prior to replacing your fluid. We pressure test the system for leaks and to make sure your radiator cap is sealing correctly. Because the serpentine belt drives the water pump we also check it for wear and replace it, if necessary, at an additional cost to the service. A special machine is used to force the old fluid out of the system and replace it with new fluid recommended by the car manufacturer. Properly maintained fluid keeps your engine running cool in the summer and keeps it from freezing in the winter. Even more importantly, it keeps corrosion out of your cooling system. When is my car due for regularly scheduled maintenance? Your owner’s manual clearly states when factory scheduled maintenance is due and what should be done. Your service advisor can print a list of factory maintenance requirements for your car upon request. What about my new car warranty? Your new car dealer would like you to think only they can maintain your warranty by doing factory scheduled maintenance. Not so. Our trained mechanics will keep your warranty maintenance current at a fraction of the cost of taking your car to the dealer. What types of cars does Quality Tune-Up service? We service all makes and models from Acura to Volvo and everything in between. Full service auto repair is provided by our trained mechanics. Many are certified by the Institute for Automotive Service Excellence. Quality you can depend on. Most routine service done while you wait. No need to leave your car for the day unless you want to leave it. Quality and convenience. Lower cost. We don’t have the same overhead as a dealer so we can do the same service for a lower price. Quality for less. Our trained mechanics check your car for safety and let you know if it needs a fuel Injection service. If that is the case we are ready to perform any fuel system maintenance you may need. When should the fuel system in my car be cleaned? We recommend cleaning your fuel system whenever we change a dirty air filter or fuel filter or when we perform an engine tune-up. Why should I have the fuel system cleaned? Over time your injectors, intake valves and cylinder heads get dirty. Carbon and varnish deposits from the combustion process keep your engine from running efficiently resulting in lower miles per gallon. What does the fuel system cleaning include? Our trained mechanics inspect the system for leaks and damage prior to cleaning the system. First, a special cleaning additive is put into your gas tank. Then a second chemical is run through your engine using a vacuum line hooked to your fuel line. What about the fuel filter? When your fuel filter gets clogged it affects the ability of the engine to receive the proper amount of gasoline to function. If it is completely clogged the engine will not run at all. Changing the fuel filter is a separate service that may be recommended by our qualified mechanics when it is needed. Better engine performance and increased miles per gallon. Why kind of services does Quality Tune-Up provide for my car or truck? Quality Tune-Up is a full service auto repair facility with trained mechanics ready to service every component of your automobile. You mean Quality Tune-Up does more than change the oil and perform smog checks? Of course. Our trained mechanics work on brake systems, power steering, engine repairs, computer diagnostics, transmission services, coolant system services, timing belts, radiators, water pumps, air conditioning compressors and climate control systems… In short: We do it all. Isn’t that type of work expensive? Some repairs are certainly more expensive than others but at Quality Tune-Up we can usually get you back on the road for less. Then how can you do it for less? Lower overhead. Our shops are very small compared to a new car dealer’s facility but we have the buying power of a large company due to the size of our franchise. Quality Tune-Up is a full service automotive repair facility with fair prices, fast service and trained mechanics. We truly offer quality you can depend on. Your vehicle’s engine is made up of many moving parts, and those parts need to be properly lubricated to avoid damage to your vehicle’s engine. Lubricating oil in the engine provides this vital service, but over time that oil breaks down and becomes contaminated with dust, dirt and debris from your engine as well as the environment around you. Changing your oil and filter will help your vehicle’s engine continue working at its best. Our technicians will consider the make, model, condition and mileage of your car before recommending the necessary oil change. We offer synthetic blend, high mileage or full synthetic oil change packages that are recommended based on your car’s individual needs. Plus, all services will be warranted for three (3) months or 3,000 miles unless otherwise noted. 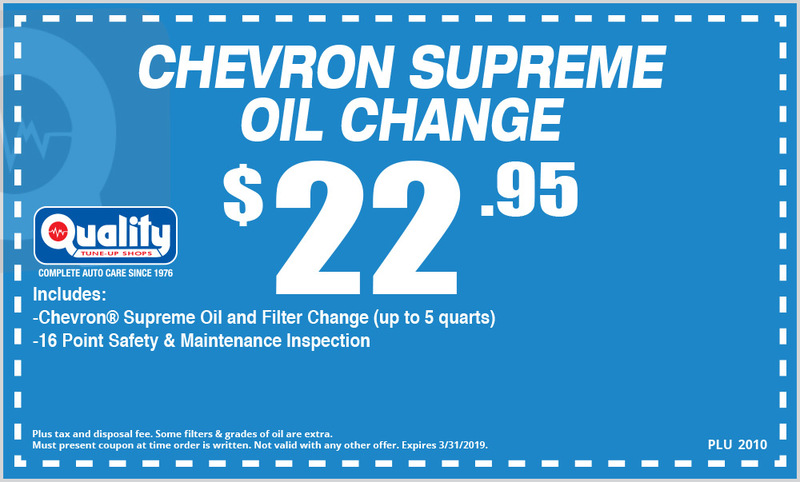 What more could you ask for in an auto repair shop that offers convenient oil change service? When Does my Car Need an Oil Change? The short answer is, before sludge starts forming. The timing can really vary depending on the vehicle you’re driving, the conditions in which you’re driving, and how you drive. Look to your vehicle owner’s manual for a recommendation from the manufacturer, or bring your car into Quality for a recommendation from one of our service professionals. Our certified technicians will be happy to change your oil and offer any advice about future service that will help keep your vehicle safe and fuel-efficient. After all, we have your best interests at heart, and that is why we are delighted to serve a growing family of loyal clients in the Sacramento and San Joaquin Valleys. When should I replace the power steering fluid in my car? By the time you start to hear squealing when the wheel is turning or the wheels begin to turn in a jerky motion it is past time for a change. Our qualified mechanics test your fluid free of charge when you come in for service with a chemically treated paper that indicates if the fluid needs to be replaced. Like most of the fluids in your car power steering fluid breaks down from constant use. Once it begins to break down it leaves deposits in the components of your system. These deposits cause excessive wear and can result in expensive repairs when a major component fails. What does the power steering fluid replacement service include? Our trained mechanics inspect the system for leaks and damage prior to replacing your fluid. A special machine is used to force the old fluid out of the system, followed by a chemical flush to clean the power steering components. Once the old fluid and chemical cleaner is forced out of the system new fluid is added according to the manufacturer’s specifications. Properly maintained fluid keeps your power steering working correctly. It prevents component failure and helps prevent the need for expensive repairs. Why should I get preventive Maintenance? With the beautiful weather we have preventive maintenance may seem like an unnecessary expense, but it often involves matters that you’ll have to take care of sooner or later. Paying for the preventative maintenance sooner will often be a less expensive undertaking. Most important, however, is that preventive maintenance will help keep you and others safe. If you don’t keep up with your car’s preventive maintenance, you may find yourself stuck or in need of repair when you need it the most. Quality Tune-Up will look over your vehicle and make sure it’s running safely through preventative maintenance. It’s always better to be safe than sorry, and since we love our clients so much, we wouldn’t want their cars to fail them or put them in danger. Is it time for your smog check? It’s good to know that smog technicians are always on duty at Quality Tune-Up. Thankfully, most cars pass the smog test — but if your car fails, Quality Tune-Up is authorized by the State of California to make adjustments or repairs, at each location, on the spot. These services are provided for most cars and light trucks. Do I need an appointment? There is never an appointment necessary at any Quality Tune-Up Shop. How do you know when it’s time to change your automatic transmission fluid? Check your owner’s manual or ask your Quality Tune-Up Service Adviser for recommended intervals. Your driving habits can influence the mileage between changes (see severe vs. normal driving). At Quality Tune-Up our qualified mechanics can perform a test on your transmission fluid with a chemically treated pad to determine if your transmission fluid is ready to be changed free of charge anytime you are in for service. What does an automatic transmission service include? We use a pressure system to force out the old transmission fluid and replace it with new fluid or we drain the fluid through the transmission drain plug and refill it to the correct level. What if your car has a manual transmission? Our qualified mechanics test your fluid with a chemically treated pad to determine if it needs to be replaced and replace it as needed. What about the transmission filter? Depending on the condition of your fluid and your mileage the filter may also need to be changed. This service involves removing the transmission pan and replacing the gaskets as well as replacing the fluid. Your Quality Tune-Up service adviser can tell you if you need a new filter. Transmission fluid wears out over time. Because it lubricates one of the most important parts of your car changing it regularly will help your transmission last longer with fewer repairs. Where should I go for a tune up in Sacramento, in addition to car maintenance and auto repair? Quality Tune-Up offers exceptional car maintenance and auto repair services to Sacramento communities and beyond. No matter the tune up service, our team of expert mechanics are here to help. Why are tune ups important? Regular scheduled tune ups can drastically improve the efficiency of your vehicle’s engine. When your car, light duty truck or SUV is properly tuned, all components of your vehicle’s engine are efficiently working together. Just think, one spark plug misfiring half of the time can reduce fuel economy by 7% and two can reduce it by 20%. Routine tune ups are an essential part of car maintenance and auto repair. To keep your vehicle performing at its best, while emitting minimum pollutants, visit our shop for our tune up services. How often should my vehicle get a tune up? At Quality Tune-Up, we recommend bringing your vehicle into our shop for car maintenance and auto repair services every 30,000 miles. And even if you’re driving a late-model vehicle, it is a misconception that it doesn’t need routine car maintenance and auto repair to make it perform its best. What does a tune up service include? At Quality Tune-Up, we always strive to achieve your 100% satisfaction. No matter the service, from tune ups to auto repair, we are eager to have your vehicle running in its peak performance.